Editors Note: This article is part 2 of our 4 part series on surviving the ongoing hop shortage. Our first article was on Growing Hops at Home. With hop prices pushing $5 US per ounce and the hops crisis likely to get worse before it gets better, caring for your precious hops supply is more important than ever. Today we’re going to look at the best way to store and preserve your hops and also some of the effects of hop aging. All hops will age over time. Precious hop oils including both aromatic and bittering oils tend to break down over time, and old hops will lose aroma, flavor and bitterness as they age. Stale hops will take on a cheesy or skunky flavor that can ruin your beer. 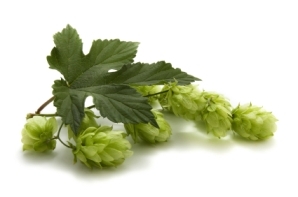 Hops have three main enemies: heat, light and oxygen. Heat accelerates the chemical breakdown of hops including both aromatic oils and the precious alpha acids that provide most of the bitterness in beer. The relationship between temperature and hop bitterness is exponential – it is cut in half for every 15 degrees C (27 F) of lowered temperature. Hops stored at 75F will degrade almost 4 times as fast as hops stored in a freezer. To slow the aging of your hops, always store them in the freezer at a temperature between 30F and -5F (-1 to -21 degrees C). Light is also a natural enemy of hops. Hop cones are susceptible to breakdown from sunlight from the first minute they are picked, so hop growers go to great lengths to make sure that hops are not exposed to sunlight after picking. 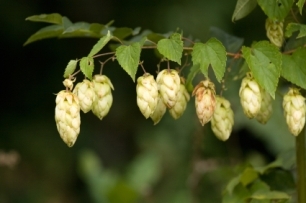 Hop cones exposed to light will break down rapidly, leaving off flavors in your beer. When possible, store your hops in a dark place and avoid exposure to sunlight. Oxygen is also an enemy of hops because hop oils and alpha acids will oxidize. Oxidized alpha acids lose their bitterness, and old hops will take on a “cheesy” aroma. A plastic/poly bag is the worst storage vessel for your hops because plastic bags are still permeable to air. You can smell the hops right through a typical plastic bag, which is an indicator that it is not much of an oxygen barrier. An oxygen barrier bag or an airtight jar make a much better container, though these still typically contain some air. The best container is a vacuum sealed oxygen barrier such as a vacuum packed foil pouch, typically made from a layer of food grade plastic and layer of mylar. Note that whole hops degrade faster because of the larger surface area exposed to air. Most hop processors will at some point pelletize their aging hops because the highly compressed pellets age more slowly than whole hops. Pellets also take less space and are easier to vacuum pack, which is why they are often used in homebrewing and microbrewing. Hop Storage Index: How Long Can I Store My Hops? The speed of aging varies by hop variety. The aging rate for a particular variety is measures using the Hop Storage Index (HSI), which is the amount of hops alpha acid potential lost in 6 months when the hops are stored at a constant temperature of 68 F (20 C). Hops will last over three times as long as their HSI would indicate if frozen and stored properly. For example a hops with a starting alpha of 10% and HSI of 25% stored for 6 months would lose 25% of its alpha potential, resulting in an new alpha rating of 7.5% if stored at 68F. The same hops stored for 6 months at 28F (-2C) would only lose 10% of its alpha acids leaving it at 9% alpha content. To see sample HSI ratings for various hop varieties, visit our Hops Listing and click on the hop variety of interest. The HSI is on the detailed page for each hops near the bottom. The HSI does not tell the whole story however. Hops will age at a much slower rate if stored in cold temperature and in a proper container. BeerSmith has a Hop Aging tool (Tools menu) you can use to calculate a particular variation of hop packaging, temperature and age, and also has the HSI in its hops database so you can just pick a hop variety, set your storage conditions and calculate the resulting alpha. Which brings us to the final question – how long can you store your hops without ill flavor effects? It turns out the aromatic hop oils are the most susceptible to aging, so if you are looking for a burst of aromatics with hops added at the end of the boil or for dry hopping, choose fresh hops. If properly stored, many varieties can be kept for several years. You can use the HSI or detailed hop aging tool as a guide as follows: Hops are considered “bad” by commercial growers when they drop below 50% of their original alpha acid content. At this point, the hops typically take on a “cheesy” aroma, and should be discarded. I will note that even “poor” HSI hops with 50% HSI will last the better part of a year if stored properly in a freezer and oxygen barrier bag. Hops are a precious commodity, and likely to become more scarce until the 2008 crop is harvested and processed. Please remember to keep your hops away from light, in the freezer, and in an oxygen barrier container. Thanks for joining us again this week on the BeerSmith Home Brewing Blog. Join us next week for another article on hop crisis survival strategies. Please give us a guest vote on BrewPoll if you enjoyed this article, and don’t hesitate to subscribe for regular weekly delivery. It turns out the aromatic hop oils are the most susceptible to aging, so if you are looking for a burst of aromatics with hops added at the end of the boil or for dry hopping, choose fresh hops. I am growing hops and its time to harvest now this is all new to me. My plants are two years old and quite bountyful. Thanks for the pointers I have alot to learn. We have hops growing in the back yard and they are starting to smell great. I intend to vacuum pack and freeze them when they are ready. That is my question – what physical charactistics will tell me when is the best time to harvest them? Any help will be appreciated. The hop plants are a salvage from a neighbor and I do not know what type they are. Brew606 – Do a quick search of the articles here for our series of articles on growing hops. These detail how you can tell when the hops are ripe as well as how to pick them, dry them and store them. Much of what I have heard about drying hops mentions the importance of temperatures and time in drying. The article on hop growing here said 1 to 2 weeks in a paper bag. So I was rather surprised, when my hop crop was air and heat dried at between 70 to 100 degrees for over night. When I questioned which was best I was ignored. So can anyone help (a dumb blond) on this issue? Wouldn’t the heat from the over night drying do the same damage that sunlight etc. does? While I do suggest storing your hops in air tight containers, we only use nitrogen purged Mylar bags, I would certainly not freeze them. Keep them at between 28-32 degrees and you will be fine. If you drop the temperature down to zero, you run the risk of damaging the essential oils. Storing Your Beer Brewing Hops, Grains and Yeast | Drinking Beer Inc! Storing and Preserving Your Beer Elements - Talking About Craft Beer And Traveling The World. Next post: Calculating Hop Bitterness: How much Hops to Use?